Police are investigating the attempted 'housebreaking', which happened in Edinburgh. 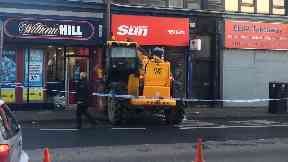 A stolen digger was used to smash into the front of a shop in Edinburgh during an early morning raid. Police are investigating the attempted 'housebreaking' after the JCB destroyed the front of the newsagent on Gorgie Road. The incident was reported at around 4am on Thursday. The digger was earlier seen in convoy with a black Mercedes 4x4 and a white Ford flatbed truck. 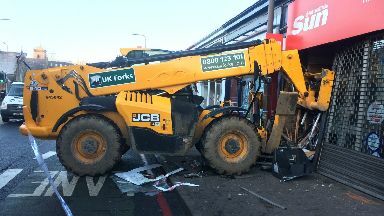 Inspector Scott Richardson said: "The JCB digger was stolen from the Keepmoat building site on Calder Road, and was seen in the area in convoy with a black Mercedes 4x4 and a white Ford flatbed truck. "I'm keen to hear from anyone who may have seen any of these vehicles and may be able to assist the investigation." Edinburgh Travel News tweeted that the road was partially blocked and warned that traffic was slow in both directions. 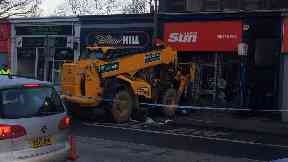 This incident comes almost two weeks after a digger was used to ram into the front of a Spar store in Moray. A 35-year-old man was later arrested over the break-in.